- First, try explaining what the themes are. They are patterns of feelings, thoughts and behaviors. What’s a pattern? Well, if something happens 1 time, it’s an event. But if the event happens over and over, then it’s a pattern. For example, if you have an old rug or carpet, you can see the traffic pattern worn into it. If someone walked across it 1 time, it wouldn’t leave a worn pattern. But, if overtime people walk from the living room to the front door then a pattern develops. Our themes are patterns for how we respond to stimuli in our environment. They are spontaneous, meaning we don’t plan them ahead of time. StrengthsFinder looks at 34 of the most frequent patterns of thoughts/feelings/behaviors that people have and asks well-researched questions to identify your top patterns. Let’s go over them together and see if you can spot the patterns in yourself. - Then, talk through the themes with the person. Begin with number one and work through all 5. First, a short overview of the theme. For example, if it’s Restorative say something like “The Restorative theme is about repairing things that aren’t working. This could be physical things or relationships or self. They are always on the lookout for what’s not working well. And, because this theme goes with them everywhere they go, the one constant in all their situations is themselves so they are always looking for ways they can be improved. People with this theme tend to be self-critical.” Keep it conversational, do not treat it factually this is who they are. Many people try to be the “exception” to things so they don’t want to be told who they are. But, everyone wants to be known for who they are so if they can tell YOU who they are they are more likely to participate with an open mind. Asking questions to the individual is another way of getting the person to participate. - Usually, this combination of brief explanation of the theme and then asking them questions like “How do you see this playing out in your life?” or, if that’s too general, focus the question towards an area of their life; do you see this in your work, around the home, in your relationships with friends. These prompts help their mind search for where they can see the theme. Remember, our themes hide in plain sight. People have to be helped to spot their themes. 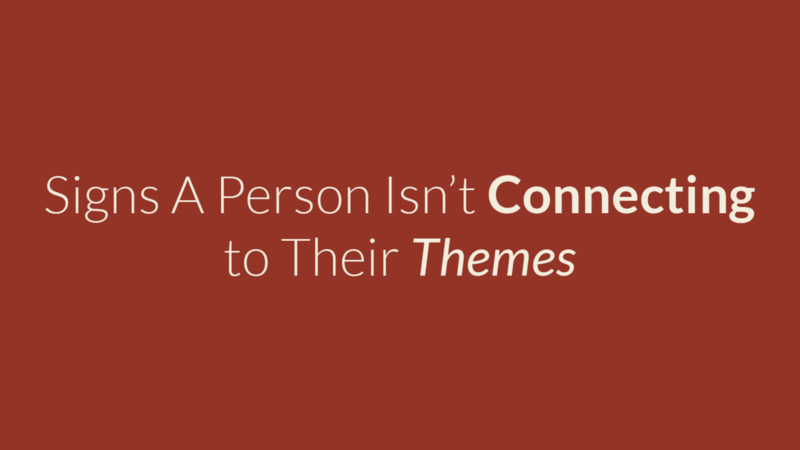 Most often, people willingly offer connections to their themes. If someone is truly interested in self-discovery, they are going to help find ways their themes play out. - If someone simply can’t see any connections to any of their top 5, it suggests they are on the extreme end of lacking self-awareness. Take time to explore other areas in their life where they seem like they lack self awareness. If the person seems self-aware but doesn’t see connection to their themes, then the next thing question might be are they deliberately being evasive. Some people just don’t want to be known. - If this technique is lacking progress, changing directions and try another approach. Instead of trying to convince the person that their themes are accurate, the need might be that they should take some time over the next week and see if they can spot their themes happening and then schedule a follow up session.